The Challenge post hole digger drive unit is operated by a third service from the front-end loader to drive whichever size auger is fitted. The operator controls the front-end loader arms to provide downward pressure while drilling the hole, or by raising the loader arms to lift the auger out of the hole. The Challenge post hole digger is supplied with a one piece attachment carriage. The drive unit can be positioned to the left, right or centre of the carriage to suit individual needs. 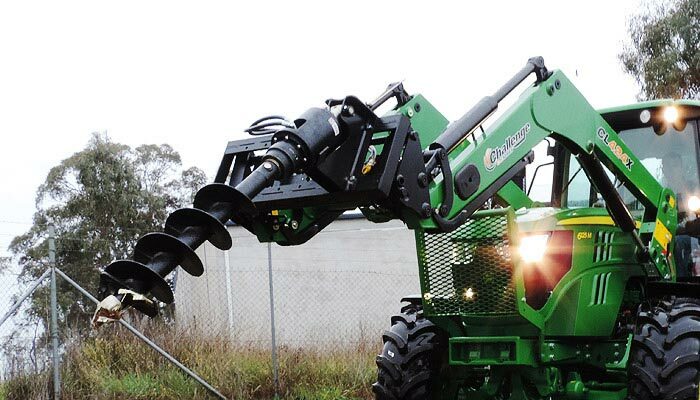 The Challenge post hole digger requires a third hydraulic control circuit to activate the rotating portion of the attachment; the electric third service feature comes standard with the Challenge CLX™ series front-end loaders. The figures shown below are theoretical and provided as a guide only. Note: Challenge accepts no responsibility/liability for any direct or indirect loss caused to person(s) who use this information which is only intended as a guide. Suitable test equipment must be used to obtain accurate values. Flow rate range refers to the flow rate delivered to the attachment. To determine the appropriate drive unit model to suit your tractor, check the tractor hydraulic specifications from your tractor manufacturer. Note that hydraulic oil flow at the attachment may not always be equal to the total oil flow indicated in the tractor specifications.